Great bands draw on a lot of different emotions, even if there’s a core one that they love coming back to. 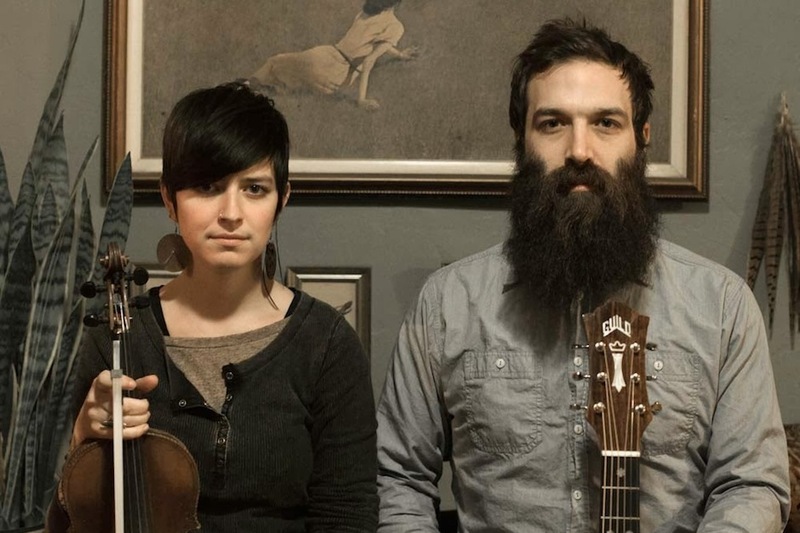 For a lot of folk and bluegrass groups, those emotions tend toward hearth and home. Love. Simplicity. Love and simplicity waiting at home when you’re far away. Sad stories with soft corners. God’s love. Ethereal and faraway sounds. And some drinkin’, smokin’, wine and women songs on the other end of the pendulum as a balance. Probably a fiddle and mandolin breakdown or two, in a major key, because happy is always a crowd pleaser. It’s not that Brown Bird, a bi-coastal duo, isn’t (or wasn’t) capable of that. There’s plenty of happiness and hominess to found in their catalog. But on the flipside of typical rootsy groups, they’re more nods to the other end of the pendulum than the norm. The downside is where their music lives. Their sad stories have hard, rusty edges. Up close and personal. Lot more devils than angels, and not in a typical morality tale trope. And not only are there not really traditional instrumentals to speak of – hands are already pretty full when you’re just a twosome sporting a guitar, bass/cello, and still keeping a beat – it’s a lot of minor keys. Delta-bluesy with, in most cases, a couple dozen extra beats per minute. Murder by Death with fewer band members and more grit. I’m a melody guy. Good lyrics can take a good song and make it great, but without a solid melody, good lyrics just feel like pretension or showing off. You can sing along to lyrics you haven’t really thought about or completely disagree with and not have a single qualm about it, if it has a decent melody and instrumentation. No melody, no memory. Brown Bird’s melodies and sound are what brought me in – a homey, folk sound that I loved, and a story that was different from anyone else in the space. They sport the typical instrumentation – banjos and guitars, bass, cello and fiddle, simple percussion…the twist being that it’s two people covering them all. Ridden harder with lead singer David Lamb’s made-for-blue-notes voice and growl, MorganEve Swain’s contrasting plaintative call. All that hits an awful lot of emotions (‘feels’, for the young crowd) before the lyrics even have a chance to raise their hand. Toil. Frustration. Fear. Anger. Enough of all of it to necessitate one of the best beards in music. And then the lyrics come in. Never dark enough to see them as a force for the darkness in their music and stop rooting for them. But more than enough to know it’s there…and like it. Their last three albums – The Devil Dancing, Salt For Salt (NPR’s favorite folk album of 2011), and Fits of Reason – are all fantastic. For an intro, their Dirt Floor Recording Studio session is tremendous for a quick taste of their sound and style, and to reinforce that it’s just two people making all of this happen. Also to be found: Beard. Lots of beard. …and I’ve got 11-20 right behind them. But Dave would kill me if I used his space to just drop a list of 20 songs on you. So, instead, here’s a Spotify list of these favorites and more. Ecstasy at finding their raw, bluesy sound with a voice and themes beyond the norm for folk artists that I just can’t get enough of. And agony at learning that I’d found them a few months after Lamb, the lead singer half of the husband-wife group had died of leukemia at a far-too-young 35. It had been a years-long struggle, one that he had first seemed to overcome, then suffered a relapse that he seemed to be beating after a bone marrow transplant (and having married his long-time partner and bandmate Swain shortly before), and ending sadly in April 2014. His death was a tragedy to his loved ones, and while the loss of his talent pales in comparison to the human pain endured by his family and friends, what the world is missing in the magic he and Swain brought to the world together hurts too. Swain recently completed their final album, Axis Mundi, from material written and recorded during Lamb’s illness, and that state of mind and health is plain to hear in his voice and their words. The sound is more electric, giving us an agonizing taste of what might have been coming next, while still giving one last hurrah to a voice and a sound that would be difficult to replicate and impossible to replace. But what a run, and what a legacy.